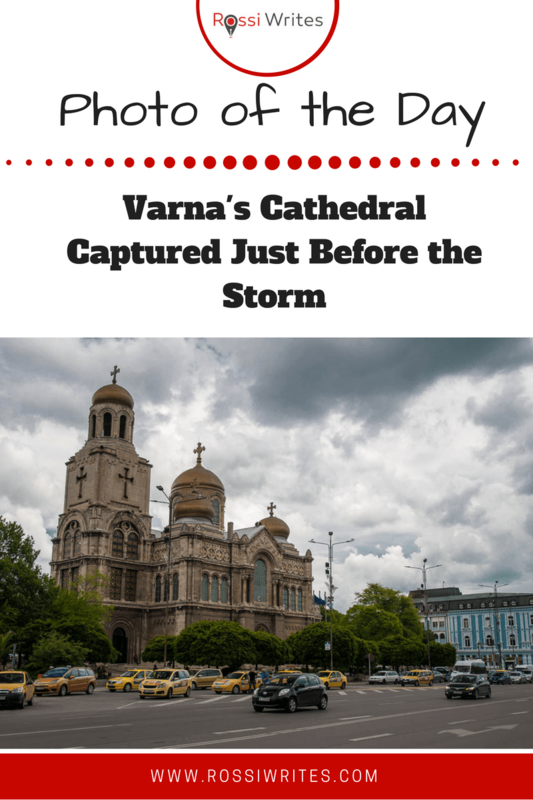 In line with the drab and abundant rain which has been soaking Vicenza since Saturday evening, today in my blog series Photo of the Day, I am posting this before the storm image of Varna’s Cathedral. I told you the story of the Cathedral and my relation to it in a blog post just over two years ago. It was called ‘The Most Iconic Place in Varna‘, so, please, do click on the link if you want to learn more about this fascinating Eastern-Orthodox church. Tonight though I want to focus just on this particular photo, as when I took it I was ridiculously proud of it. which our hobbies give us. Learning to master a craft, which is so removed from whatever else we may be doing on a daily basis to earn a salary, can bring us the sweetest satisfaction. This is the exact situation with me and photography. I feel it has been such a long road since I started taking pictures and learning about camera modes and settings. I am still very far off the polished photos I admire daily in photography magazines and websites. No, please, don’t look at this picture with the eye of a pro-photog and go: ‘Ah, but this is not quite right and that could be better’. I am sure you will be totally right. Yet, I am happy with it just as you see it. Varna’a Cathedral is quite difficult to photograph as it is (or at least it seems so to me). It is a big building fronted by trees, which obstruct the view when you try to get a shot up close and personal. I have tried many times over the years and this photo was the one time that I felt I had succeeded somehow. I like the slightly threatening grey clouds, the background with the blue building and the forefront with just the right amount of traffic so that the street doesn’t look empty and there is some dynamic to it. Above it all stands the Cathedral – the most iconic place in my hometown. For once, I felt I had done it justice. What makes you feel just a bit proud?